It’s important to put self-care on your calendar. Come & join a guided meditation so you can relax and refresh your spirit. Optional donations will support HOPE RPM for Autism - connecting non-speaking people to communication through typing to talk. This is a totally guided experience in the gorgeous space at Creative Wellness at 6:30 pm. 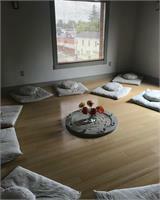 The Creative Wellness Meditation Room is a beautiful, serene space where all are welcome. No previous yoga or meditation experience is needed. Meditation is for everyone.